The country is woefully short of healthcare infrastructure as less than one-third of the population use public sector healthcare services and the government needs to take the lead in making the health system more transparent, says a report. The country is placed at the bottom fifth, with a score of 36 per cent, among the countries on the transparency index, and is woefully short on healthcare infrastructure, says a report by KPMG. 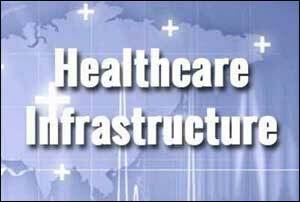 The overall shortage of healthcare infrastructure is aggravated by the inequitable distribution among urban and rural areas. Over 70 per cent of the infrastructure like beds and outpatient clinics and 80 per cent of medical professionals are based in urban areas, which are home to under 35 per cent of the population, says the report. “Our health system is unique as it grapples with the dual burden of high disease prevalence and large out-of-pocket payment for healthcare. With dominance of private sector in healthcare delivery, institutionalization of transparency measures continues to be a challenge,” it said. “Government will need to take the lead in making the healthcare system more transparent. Steps like developing a basic framework to report specific parameters, linking performance with incentives and developing a central repository with information publicly available, needs to be taken,” it added. According to the study, the country is making a gradual progress towards a more transparent healthcare system. To progress even further, it should consider mandating public reporting of healthcare outcomes, tariffs and pricing, and patient satisfaction. One key missing link is the need to develop a basic framework to report on select transparency parameters such as surgical complications, the report noted. The study mapped 27 indicators across six dimensions of transparency to provide an individual score for 32 countries. Four Nordic nations– Denmark, Finland, Sweden and Norway– stood at the top of the transparency rankings, with Australia, the Netherlands, New Zealand, Britain, Portugal and Singapore among the second tier.